Endorsed by Weight Watchers. 2 PointsPlus value per serving. No high fructose corn syrup. It is so good! High in calcium. Gluten free. With active yogurt cultures including L. acidophilus. 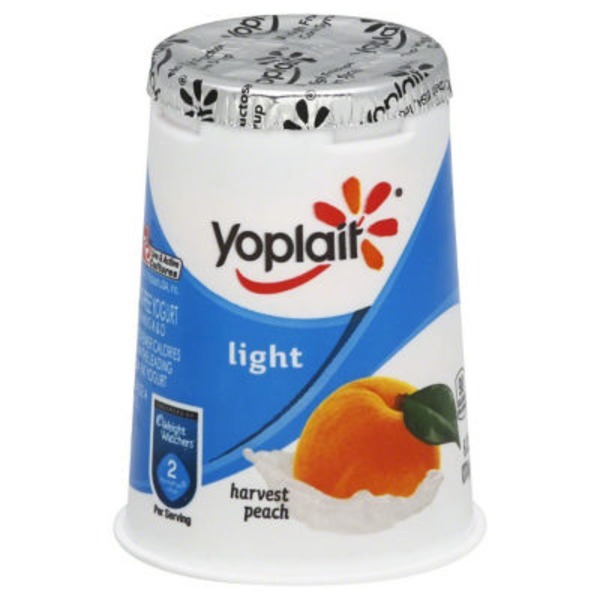 Yoplait Light (Per 6 oz): 90 calories; 0 g fat. Leading Low Fat Yogurt (Per 6 oz): 170 calories; 2 g fat. Protect wildlife crush cup before disposal. Live & active cultures (meets National Yogurt Association criteria for live and active culture yogurt). Vitamins A & D. 40% fewer calories than the leading low fat yogurt. Grade A. 90 calories per serving. Pasteurized Grade A Nonfat Milk, Peaches, Modified Corn Starch, Sugar, Kosher Gelatin, Peach Juice Concentrate, Tricalcium Phosphate, Citric Acid, Natural Flavor, Potassium Sorbate Added to Maintain Freshness, Acesulfame Potassium, Colored with Annatto Extract, Sucralose, Vitamin A Acetate, Yogurt Cultures (L. Bulgaricus, S. Thermophilus, L. Acidophilus), Vitamin D3.